There are many men in this day and age who seem to spend their time on nothing else than inventing new theories, and inventing new systems, and gutting the gospel, taking the very soul and guts out of it, and leaving nothing but the skin and bones of it. The substance and truth of the gospel are being taken away by their learning, and by their philosophies, and by their so-called improvements. But the Word of God tells us, "Let no man beguile you of your reward." Hold on to the old truths; they will outlast all these philosophies. Stand firm in the old way of living; it will outlast all the inventions of men. Stand fast by Christ, because you don’t want any other object of worship but Him. Paul gives us this warning, "Let no man beguile you of your reward,” reminding us that these people are very likely to beguile us. They will entice us by their character. Have you ever heard young people say about a preacher who preaches bad doctrine, "But he is such a good man." That’s not the point. Didn’t Paul say, "Though we or an angel from heaven preach any other gospel unto you than that, which we have preached unto you, let him be accursed." If a person could live a blameless life like the life of Christ, but he preaches something other than the gospel of Jesus Christ, don’t pay any attention to him. He wears sheep's clothing, but he is a wolf after all. Some will claim, "But he expresses himself so well." Brothers and sisters, I hope the day will never come when your faith is in the words of men. After all, there are some speakers who could convince you that the clouds are made from marshmallows. Men can speak fluently, and speak well for evil causes, and there are some that can speak much more fluently and more eloquently for evil than any of us may speak for the causes that are right. But, is it words that saved you? Is it possible, that after receiving the Holy Spirit by confessing your sins, and believing in Christ, and putting your trust in him that you can be led astray by the flowery words of men? God forbid! Let nothing of this kind beguile you. I want to add to what I just said that the man is not only very good and very eloquent, but that he is very sincere and he seems very humble. Some people are not what they seem to be. They are out to deceive others, with their false humility. Satan knows very well that if he appears wearing a red suit and carrying a pitchfork that he will be discovered. 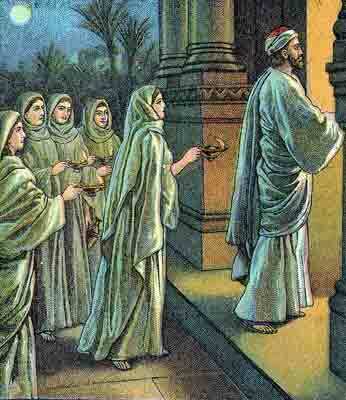 But if he puts on the garb of an angel of light, then men will think he comes from God, and so they will be deceived. "By their fruits ye shall know them." If they don’t preach the gospel, if they don’t exalt Christ, if they don’t talk about the precious blood, if they don’t lift up Jesus Christ like Moses lifted up the serpent in the wilderness, have nothing to do with them, no matter what they say. "Let no man beguile you of your reward." Although he could be a relative of yours, one that you love, one that you respect don’t allow them to beguile you of your reward. Remember, you will lose your reward if you don’t stay on the path that leads to the reward. The runner may run very fast, but if he doesn’t stay on the course, he will not win the prize. A Christian can have a very earnest belief in false doctrine, but no matter how hard he believes, it is still false. You may work tirelessly in the pursuit of the wrong religion, but it will not save your soul. LET NO MAN DOMINEER OVER YOU. Regardless of how close a man may be to Christ, the world, instead of honoring him for it, will, on the contrary, criticize and condemn him, and that’s why the Apostle says, "Let no man domineer over you." Folks, I would sincerely ask you to remember these words when you must decide what you are going to do. If you thoroughly believe that you are right in what you are doing, don’t pay much attention to what others think about it. If you believe in your own soul that what you believe and what you do are acceptable to God, then it doesn’t matter whether others agree or disagree. You are not some man's servant, so you don’t look to a man for your reward and, therefore, why should you care what man's opinion is anyway. Walk in the footsteps of Christ, and don’t depend on men or women. Don’t allow their compliments to make you feel good, because when they ridicule you, then you will feel bad. Don’t let any man domineer over you in this respect, instead, let Christ be your Master, and look for His approval. So, with regard to your choices and your confidence, don’t let any man domineer over you. If you put your trust in Jesus Christ, there are some who will say you have made an assumption. Let them say what they want. If you take the promises of God and rest upon them, there will be some who will say that you are off the wall fanatics. Let them say it. The result of sticking by your faith is that you honor God. You may only have to wait a little while, before those who have ridiculed you hold up their hands in astonishment, and say along with you, "What hath God wrought? I hope that your confidence in Christ doesn’t depend upon the approval of your relatives. If it did, then their disapproval might crush it. Walk with your Savior in complete confidence, and don’t put your faith in any man, but put it in the will of God. The next thing I want to say is, “Let no man domineer over you, by judging your motives.” There are always some people who will give a bad reason for why a good man does a good deed. It seems to be inherent in human nature to never give a man credit for being right if you can help it. And very often, those with sensitive minds have been hurt by lies, and by being accused of having selfish motives for the good things they do, when all they ever wanted was to serve Christ. But don’t let that sort of thing break your heart. Remember, you will appear before the judgment-seat of Christ, so don’t worry about these petty judgment-seats of men. Go on, and work for Jesus as long as you can. And let them say the same thing about you, that David’s brothers said about him, "Because of thy pride and the naughtiness of thy heart to see the battle, art thou come." Go on and do your best for the Lord, and when they see God blessing you, that will be the best answer you can give. When they see that God is with you, and that he has given you the victory, you will get respect, even from those who ridiculed you. Keep your eyes on Jesus, and forget that men have their eyes upon you. Live to please Him, whether they know what you do, or they don’t know what you do. Don’t pay any attention to what they have to say, since your life will stand the scrutiny of God on the great Judgment Day. Let no man domineer over you. I RECEIVE THAT IN JESUS NAME. (THE TRUTH WILL SET YOU FREE) THE ENEMY IS A LIAR AND HE IS CRAFTY,WE HAVE TO BELIEVE THE WORD OF GOD FULLY AND NOT HALFWAY .TWO BIG WORDS ARE TRULY IMPORTANT (TRUST,AND BELIEVE).BLESSES TO THE WRITER OF THAT THESIS. Thank God for the truth of the Gospel that Jesus reigns supreme. It is He that we should seek to follow not man. This has HELP me in so many ways, struggling with people and their opinions about the way I should handle my marriage. Their opinions are not God's way! I know that whim I shall Follow! Not man.